Where was he and is he? One never knows what one will run across while browsing, and reading, at the NEHGS, or any like, site. I just ran across a map (The Essex Antiquarian - available via Google, pg 149) showing land owned by two cousins, Samuel Gardner and Abel Gardner, while looking at material for an entirely different search. The article was by Sidney Perley who was writing about Salem in 1700. Of course, Sidney is writing in 1900 or so, about 200 years after the fact. We, earlier, had looked at a couple of topics: Where is Thomas? and Where was Thomas? In answer to the first, we can say that he's interned somewhere near the Peabody boarder in the Harmony Grove cemetery. In answer to the second, we'll have to say it depends. But, we know that he spent some time in the area near where the Essex Institute is now. The image shows a Perley map and a Google map side by side (somewhat oriented the same). I have marked three places on the maps for reference (Mill Pond, Burial Place, Gardner's Hill). It is about 3 miles (crow distance) from the Gardner's Hill to Mill Pond. The Perley map is quite nice and would overlay very well if I could get a precise rotation (too, there have been a lot of changes in 100 years). Perley's writeup is based upon records and is the 9th in a series that ought to be part of the bibliography (right now, the only Perley document that we have sourced is based at The University of Virginia). Both Samuel and Abel are grandsons (as such, they were first cousins) of Thomas and Margaret. Samuel is George's son. Abel is Samuel's son. Abel, and his wife, Sarah Porter, were buried near Thomas and were moved. The part owned by Abel had been owned by Thomas, originally. Having been deep into research the past couple of months, I have had more than ample opportunity to get more familiar with Anderson's work (one example). In a sense, the Great Migration work is a nice compilation [strike that, it's a condensation] and index. Serious lookers still need to follow sources back to the origin, or one might say, the first principle. Unfortunately, this need seems to be true for genealogical work, in general. It would be as if every theorem that one looks at needs to have its proof lineage known ad infinitum. But, we know that is not true, as we can take proofs at face value due to the process, and its verification style. Of course, people are working on ways to bolster the genealogy discipline (I heard a biologist argue that a lot of it is like gossip: this one said that about the other one and so forth). Going totally Gutenberg (as in a recoil from the Internet and technology) is not a step forward either. We'll get back to all of that later, as this post is not about genealogy. Rather, it's about interpretations and world views. The NEHGS has both history and genealogy in its name. Methinks that the genealogists have a larger problem with viewpoints than do those working with the minute things (consider, if you would, the abundance of quantum interpretations). And, it has been shown by some research that conflict (which can escalate to warfare at the extreme - added here to nod to the Quaker tradition) is due to differences in interpretation. The main issue? Whose worldview is sufficient for the rest? The corollary: can there be peace in the valley when multiple viewpoints are allowed? Aside: group versus the individual - ah, so much to discuss. Now, in regard to Thomas' relationships with the Quakers, there seems to be a pot boiling. I've read one talk (are there others?) in which a Friend include[d] Thomas in their Quaker ancestry. On the other hand, Lloyd de Witt Bockstruck, quoting Anderson, says that there is no evidence that Thomas was a Quaker (in actuality, Anderson says that history is silent - ah, a tabula raza situation - in which we have the duty and opportunity to fill in the pieces) . Perhaps, Anderson ought to have said that there is mostly circumstantial evidence (which can be strong enough to get fingers pointed in the context of crimes) which would imply the need to get more information. The Great Migration book did not say that "no evidence" exists and mentioned the silence of history. Ah, we know that Thomas has been written out, so to speak. What we might be trying to do is speak for the guy, in our own words (tongues). Let's look at a few things. 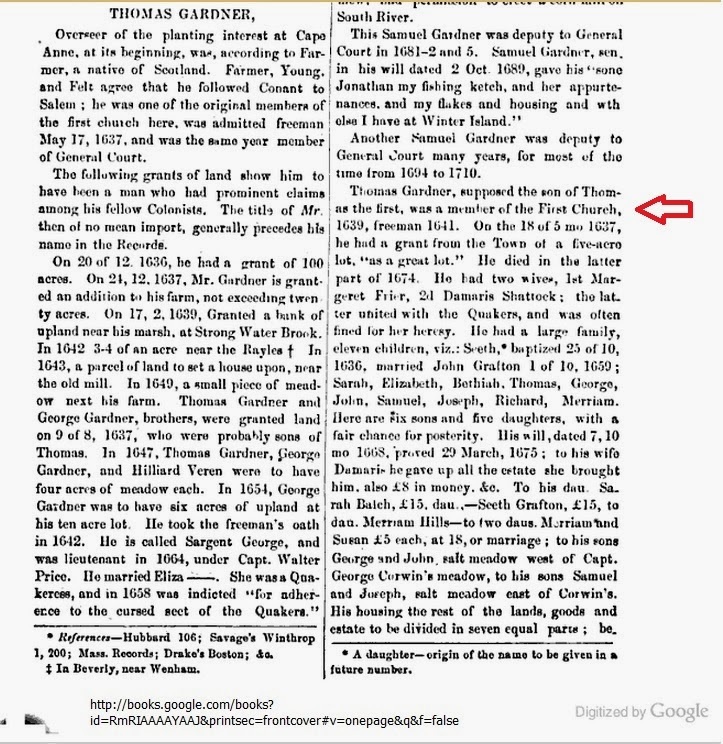 Thomas married a Quaker. In fact, they got along quite well it seems. Several of his children were Quakers. George being driven off to CT left poor Ruth so that she could be grabbed by Hathorne (great-uncle, so it's a family thing). Thomas was peaceful, though no pipsqueak. He definitely did not follow the Puritan's dogmatic view. In essence (not to Hofstadter's use of surface and essence), did Thomas exemplify the Quaker ideal? Mind you, before you answer, consider this: is Quakerism a way of life founded upon a certain viewpoint or is it being enclosed within some groupal framework that subsumes the self? 11/13/2013 -- Tabula raza? Well, let's say, blank slate. That was my first reaction four years ago when I saw two things: a dearth of material and controversy about what was there. Neither of those are bad things, but the void was obvious. And, the 400th ought to be the time to fill in some of the pieces. We can say the 300th belonged to Roger Conant. Next up will be Thomas and the others. But, for Thomas, the blank slate is multiple. Think of adding pieces of what is known (see 27 Nov 2012), for starters. What would go on different slates could be determined by strength, source, or what have you. Then, easily filled holes would be next. And, so forth, incrementally looking at the stuff. The fluidity, flexibility of cloud-oriented approaches would be great for this. ... Now, this type of thing just might suggest where to look for information. Funding? That is one factor of importance. Verification? Again, part of the solution mix. ... Did anyone say that it would be easy? The big difference now, versus when Dr. Frank was working (who, by the way, will be the backbone of the research work - as in, things would delta off of that - not Anderson), is that there is more material available (after all, 100+ years of people digging in), there are means for collaboration (again, after all, that was the motivation (primarily) for the Internet), there are fewer physical limitations (as in, research can be done against the large, and every growing, cloud'd source - as opposed to sink ;-), and more. 11/21/2013 -- It may be that Anderson's work is a compilation, when not much is known about a person. Otherwise, a few pages cannot hold what we know of many (not without converting to some condensed type of language - to wit, English-Mathematics and other examples). ..., For heritage societies, in general, one might remind them of the 5th (4th, in some cases) Commandment. Genealogy is, in part, honoring the parents, transitively through generations. Some seem to have an exclusivity notion. Of course, one either is or is not descended from someone. However, the mere fact of the documentation (or that the documentation is possible) does not make the reality. People, in their own being, know their heritage (this, yes, has to do with memes as well as genes - open to discussion as required). ... Mind you, there have been pretenders in the past, after all, that is a human trait which has not been rooted out. Too, genealogists have been led astray many times, for various reasons. But, the fact of the matter is that strictly-supportable lines are the exception (for most people, Prince William does not have any holes show up until many generations out). Then, there are those with no documentation. The in-between is where the action is (and where genealogist make their money). However, given any line, one can generate strong conjectures (yes, even with DNA, we'll have to appeal to various interpolative schemes) such that someone can know themselves better. Now, does that mean that they can join a society? No, in some cases, perhaps, in others. Can such allow insights so that one can continue looking in other than the mode of complete enumeration or, worse, random casting about (though, serendipity, and being cognizant of patterns, can bring out useful information from such)? 01/05/2014 -- anceSTORY Archives has a recent article on treatment of the Quakers. The image comes from an article written by Melissa Berry for the Newburyport News. One might title this, Puritan entertainment. No, they did not allow the usual pleasures; rather, inhuman (and inhumane) activities seemed to be their attraction. 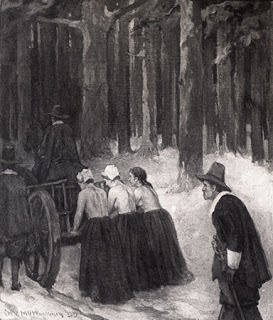 ... One thing that we can be strongly assured of [is this]: Thomas and his kin were not of those who tied women (in an unclad state or otherwise) to carts and dragged them through the streets (er, muddy cowpaths). 01/06/2014 -- The Beacon issue Vol. III, No. 4 deals with the subject and reminds us that the son of Damaris, step-son of Thomas, brought the writ from Charles II to Endicott (too late for Mary Dyer) telling him to lay off, so to speak. Much more can, and will be, said. 02/15/2014 -- Another thing to consider is that George Fox was born when Thomas was over here trying to adapt to the new world's requirements, as in helping his family and himself survive the elements (plus the machinations of the ilk that were their compatriots). So, later, even if the message of George may have resonated with Thomas (as it did with those around him), why would the old guy who had not succumbed to the pressures of the likes of Conant, Endicott, Winthrop, et al, want to bow to some young whippersnapper? Then, again, what is a Quaker? Given that George didn't suffer the same fate as Mary (think Endicott's madness), does that make him lessor of a Quaker? ... Bordering on silly? Yes. We have had the opportunity to reference Phippen's work before: Old Planters, Beverly. We, definitely, need to consider his work more, so this is a start. Phippen seems to suggest the two Thomas situation in his look at the "old planters" for the NEHGS. Perhaps, he was following Felt. Was Phippen's write up of Thomas the first extensive one? If so, we'll have to thank him somehow. See Phippen's take on the "old planters" in Volume 1 (1859) of the Historical Collections (go to page 190 for his write up on Thomas Gardner). Notice that he has the second Thomas being the father of most of the kids that we think about (see image). Aside: Recall that Dr. Frank mentioned that he did not find any support for this claim. However, it will have to be re-addressed with new look at the matter. As we get more of these together, we might have to use categories. For now, we'll just gather former posts. 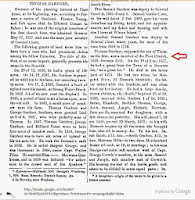 Here are two that show the two Thomas Gardners: See the mention of Jamaica Plains, Benjamin Peirce. As we consider at the Dorchester Company, it is essential to have a timeline with which to look at the details. Then, we would need a good understanding of current events and culture. 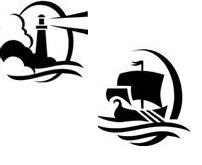 By the time of the Cape Ann venture, there had already been several attempts at establishing a colony. Those successful in the North were at Jamestown, Newfoundland and at Cape Cod (Plymouth, of course - more happenstance than not). John Cabot was roaming the North American coast very early on, under the auspices of Henry VII. His exploration started not long after Columbus' discovery. About twenty years later, fifty ships were fishing along the coast of Newfoundland yearly from several countries (Portugal, Spain, France, England). During the 16th century, there were many attempts at forming a colony. And, the fishing continued. By 1578, there were three hundred plus ships in the area due to the plentiful fish. But, by the time that Cuper's Cove (1610) was established, there had been no permanent settlement in the north. Humphrey Gilbert wanted try in 1583, but he was lost at sea before he could get things going. We all know about Jamestown further south. Then, we had Plymouth with its early problems. Yet, it was example enough for Rev. John White. At the same time of Jamestown, we had a successful effort in Maine (Popham). But, there was talk of an attempt in the Cape Code area back in 1602, when Capt. Gosnold was poking around. With all of those years of effort came a lot of experience. Ships would head out in spring with provisions and equipment. Part of the equipment were disassembled boats that would be put together at the fishing area and used during the summer. The return trip in autumn, hopefully, would be with a fully-loaded ship. The sale of that horde would pay nicely for the ship's master and the crew. But, then, the thing would re-iterate in the next spring. That was one motivation for Rev. John, namely profit. He wasn't after a religious experience (did Puritans even have such?). The foreshortened time allowed Thomas and John to be successful speaks of something (other than pure short-sighted-ness). Well, there are stories of manna (free food) in the Bible. Other types of grand, un-managed expectations are not unknown to the observant (even to this day). The change of Gardner to Conant was purely political, from what I can see so far. Conant's brothers were there with Rev. John. Details about Gardner? Anyone know? Our take, somewhat. ... Pulling together the abundance of details that are of the period will help us build a picture; such a view would help identify where to look, perhaps; as well, it could allow reasonable conjectures about the guy. See Vol. III, No. 3 of Gardner's Beacon for a look at events around Thomas' time of arrival. 11/06/2013 -- Reading Staloff's work will be interesting. It both grates and intrigues. The former comes from being a doer (versus a navel ponderer), somewhat by force (not born into the leisure class such that I could go astray as have the best and brightest - ah, the perdition the smart arses get us into). Any bit of progress comes from effective people (know how, can do, etc.). Granted, some have to be in leadership positions. Take the military, for example. Washington was out with his troops, albeit he had a tent and Martha to comfort him on occasion - he had shoes, to boot. Nowadays? We have a commander who shoots off lethal items from remote locations (via drones) without, seemingly, any regard for the human aspects. ... So, who would you want to be on a deserted island with (keep it clean)? An intellectual? ... Say, given Maslow's work, intellectuals, many of them, do not even know how to meet the needs of lower order. Now, for the latter, part, the intriguement (urban use, okay?). The book is partly readable on-line, enough material available to gestalt with. What a lot of ado (about nothing?). I wonder how many of this American thinking class contributed to the ugly American reality. ... We don't have any writings from Thomas, but we do know that he was effective in many ways. One of our tasks will be to describe the ways. However, he married a Quaker. That says a lot. Too, he seems to have steered clear of too much church involvement (ahead of his time, so to speak). He seems to have gotten along with Endicott. I wonder what his relationship was with Conant. He went to the General Court a couple of times. Most likely, that grated. I don't know how Thomas would have gotten along with Winthrop and his ilk. By the way, was Rev. John really related? ... So, who was this guy, Thomas? That is our quest, to answer that and other questions. 01/19/2015 -- Maine History Online: Popham, Gorges, Gosnold, et al. This company (and Rev. John White) is the focus of the next issue of Gardner's Beacon. There is a lot to be said for the company as many have weighed in with their views. It might be interesting to collect some of these here, whether or not they mention Thomas. Too, research, and summaries thereof, needs to take a broad scope, probably wider and deeper than that taken by the Great Migration project. Such work will take some time; priorities have not been set. Right now, the thing is to gather material (even those that are, might be, of lessor value). So, the bibliography will continue to grow (we'll have a section for material from websites). This time around, ought we have a Dorchester Company subsection? As well, most of the material that we use will be accessible on-line. Library work will occur as time permits. Or, I ought to mention, work will depend upon having access to material. From what I've seen, the Boston area is loaded with gems (need to spend some time there); perhaps, someone in that locale will contribute (as John Goff did earlier). answer.com - This site has a nice little overview with interesting sources. One thing mentioned is that several men were left to over-winter in 1623. When did Thomas arrive? Then, or the next spring? By the time that Roger arrived in 1625, the headcount was fifty persons or so. Salem Focus - The site deals with Salem. The particular PDF presents a story, in the early chapters, about the Cape Ann/Salem crew that was written by Richard Scott. The author starts each chapter with a year-event tidbit. Nice, as these can help motivate the look back in annals format. Governor Roger figures heavily. Governor Thomas has a mention or two. John Balch and a few of the other "old planters" have roles, too. Up to Chapter 30 (covers the period of 1661-1674) deals with the early times. Two books of interest: Vickers (1994) - Farmers and Fishermen: ..., Staloff (1998) - The Making of an American Thinking Class. In terms of the first, there is a nice discussion that helps to think about the motivation for the Cape Ann crew's configuration. The second? Ah, yes, the class that can do nothing but split hairs (for whom the farmers and the fishermen labor - how did this come about?). Ah, why there is a backbone series. We will be adding to this list as we find interesting things related to the theme of the issue. 08/29/2016 -- More on Cape Ann, 1623. 11/01/2013 -- When we get a few things collected for the Dorchester subsection of the bibliography, we'll put a notice here. 11/06/2013 -- While working on the next Beacon, I ran across some books. The one by Staloff was timely; imagine, I was wondering why the backbone series? Has the talented set ever allowed the lessors to have some semblance of a good life? Oh, you say yes? Winthrop, et al, were against this from the beginning. The stalwart of what could be (or could have been)? Thomas Gardner, of course.